Despite considerable progress in science and technology and solid economic growth in many parts of the world the last decades, many countries in Asia and Africa are still lagging behind the ladder of development. Challenges related to education for all, access to health care and social services, water supply and sanitation along with the preservation of the environment continue to beset many developing countries. Many studies carried out by United Nations Development Programme (UNDP) and the World Bank indicate that Sub-Saharan Africa is still facing challenging issues of dire poverty, weak civil society, entrenched corruption, poor governance, to name a few. The last 40 years have witnessed the efforts of donors and international institutions like the World Bank, the International Monetary Fund (IMF), and United Nations Development Programme (UNDP) to propel the development pace in Sub-Saharan Africa through capacity strengthening initiatives and Wide Sectors Approaches (WSA). Yet the challenges outlined above remained to be tackled in an effective way. The new consensus in the development discourse draws from the assumption that development is likely to happen in a given context when capacity is sustained through long-term efforts on individual, organizational and enabling environment levels, with the emphasis laid on local ownership and systemic approach. In this perspective, it is argued that human development is linked to the ability of individuals, organizations and society as a whole to manage their affairs successfully (OECD 2006). The Technical Assistance approach of the 1970â€˜s and the 1980â€˜s was mainly based on the transfer of skills, competence and expertise from the North to the South without attention being given to contextual factors and sustainability. Developing countries were then able to fill their competence gaps, but without creating the capacity needed to sustain social change and development. 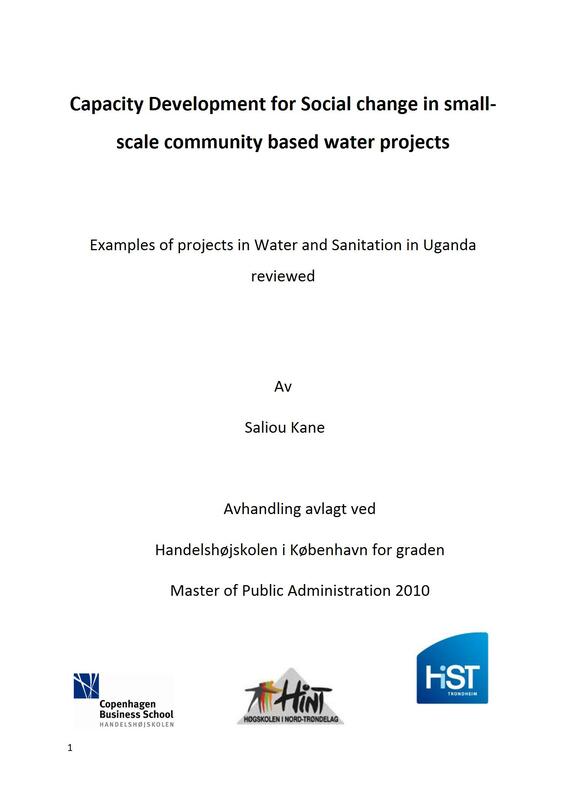 In my research I intend to focus on the extent to which capacity development can bring about social change in rural poor communities with a particular emphasis on community mobilization in small-scale community based projects in the sectors of Water Supply and Sanitation (WSS). Access to clean water and sanitation is a critical indicator of the UN (United Nations) Millennium Development Goals (MDGs) number 6 which is aiming at combating HIV/AIDS, malaria and others diseases in developing countries. Norway is among the 189 member states of the UN General Assembly which have adopted the Millennium Declaration in 2000.